Kibale National Park is the ultimate destination for chimpanzee tracking in the country. You will find 13 species of primates, as well as dozens of other species that can be seen on primate walks. Butterflies and birds are also abundant. There is a wide range of habitats over different altitude zones in Kibale National Park. The tropical forest located on the Fort Portal plateau is gets replaced by a savannah in the Albertine Valley floor. The forest didn’t suffer that much from logging when compared to other forests. Therefore, it is quite pristine and houses figs, mahoganies, and other hardwoods. There are 13 species present at Kibale National Park and its diversity is one of the highest in all of Africa. The most popular activity is definitely chimpanzee tracking. Some of the other primates including blue monkey, black and white colobus, and grey-cheeked mangabey can be regularly spotted. Chimpanzee tracking is possible all year long here in Kibale. The driest months are December to February and June and July. These months are also the best time for chimpanzee tracking because the trails are easy and there is little rain. December to February and June to July: This is the dry season and it’s mostly sunny with clear blue skies. However, these months are also the hottest. The temperature goes down at night. March, April, and May: It starts raining in March and there are plenty of overcast skies. Expect to see more rainfall in April and May. August, September, October, and November: These are the months when there is a lot of rain. The wettest month is October. Kibale National Park is usually a destination where you stop on your way to other parks like Queen Elizabeth National Park or Bwindi Impenetrable National Park. It is located in the western part of Uganda, just 22km/14mi southeast of Fort Portal and 360km/224mi from the Uganda’s capital city, Kampala. The entrance point to Uganda is the Entebbe International Airport (EBB). It is located 46km/29mi from Kampala. The local tour operator picks up the passengers from the airport and provides further transportation as a part of the safari tour package. Your tour operator is also usually in charge of arranging domestic flights between the parks in Uganda. Daily scheduled flights with seat rates to Fort Portal are run by Fly Uganda. One of the most popular savannah reserves in the country, Queen Elizabeth National Park features a wide variety of wildlife and offers a variety of habitats including lakes, wetlands, grassland savannah, and forests. It is an ideal setting for many primates and large mammals. You will have a chance to see four of the Big five here at Queen Elizabeth National Park. Only Rhino are absent. Queen Elizabeth National Park is conveniently set against a backdrop of the Ruwenzori Mountains. Some of the other scenic points include Kazinga Channel right between Lake George and Lake Edward and more than 10 crater lakes. Open savannah is the easiest part of the park to get to. However, the public has access to the large forests such as Maramagambo forest and Kyambura Gorge. You will have a chance to spot buffalos and elephants, as well as lions. Unfortunately, giraffes and zebras are absent, but hyenas can be occasionally spotted. Several interesting species of antelopes can be seen here including bushbuck, topi, and Uganda Kob. Kazinga channel is home to hippos and crocodiles, while chimpanzees have been habituated for tracking. You will also find nine more primate species including the black-and-white colobus monkey. 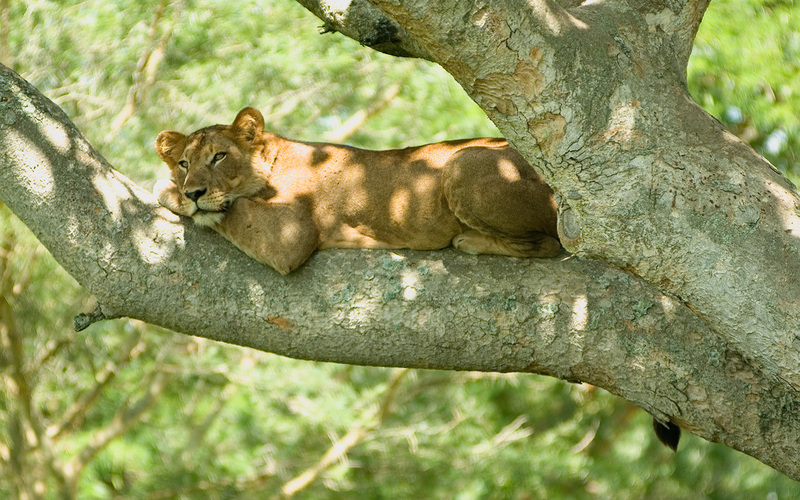 Head out to the Ishasha sector to see tree-climbing lions. Giant forest hog can also be easily spotted in the park and buffalos are often reddish-brown because they inbreed with the forest buffalos from Congo. 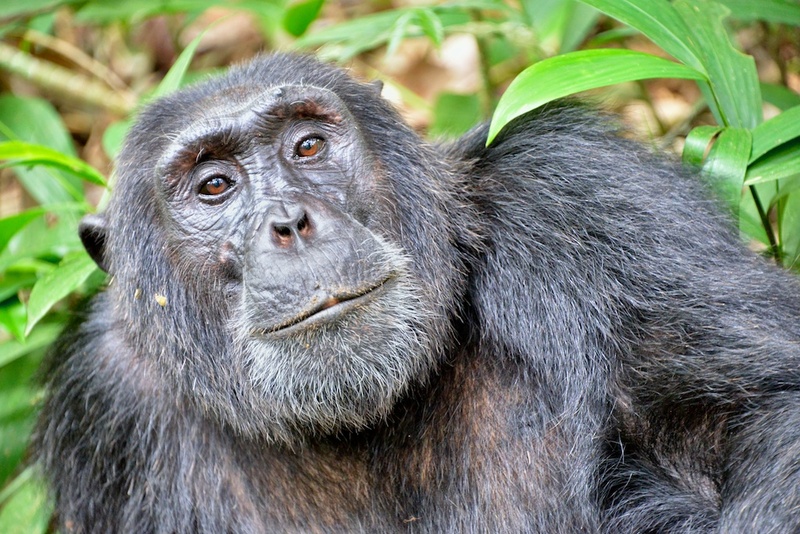 If you are interested in Chimp tracking, go to the steamy forest of Kyambura Gorge. Queen Elizabeth National Park is open throughout the year. The dry season that lasts from January to February and June to July is the best time for wildlife viewing. You can also visit the park in the wet season from March to May and August to December. Keep in mind that heavy rain might influence the quality of your safari during this time of year. December to February and June to July: Expect to find plenty of sunshine and little rain during these months. It can also get really hot in the dry season, but nights are chilly and ideal for sleeping. March, April, and May: Expect less rain in March and more rainfall in April and May. August, September, October, and November: These four months are known to be the wettest season of the year. October brings heavy rain, while the temperature usually increases in November. Located around 410km/255mi from Kampala, Queen Elizabeth National Park can be reached in about 6 hours. Keep in mind that the itinerary usually includes visits to the parks on the way. You can also take a flight to nearby airstrips of Ishasha, Mweya, and Kasese by a charter or scheduled aircraft from Entebbe International Airport or Kajjansi Airfield. Tourists will land at the Entebbe International Airport (EBB), which is located about 46km/29mi from the capital city of Kampala. In most cases, the tour operator arranges pick-ups from the airport and organizes further transportation as part of the safari package. There are domestic flights between Ugandan parks which are usually arranged by your tour operator. Offering amazing wildlife viewing, Murchison Falls National Park is a part of the well-known Murchison Falls Conservation Area (MFCA). Tourists will have an opportunity to see many safari animals including four of the Big Five. The Victoria Nile divides the park and one of the highlights is definitely a boat trip to the amazing Murchison Falls. Make sure to hike to the top of the waterfall for spectacular views. A boat trip ride will take you to the base of the Murchison Falls. Here, you will be able to see the scenic Victoria Nile River going through a narrow gorge before it drops into the Devil’s Cauldron. There is a savannah habitat north of the river which boasts grasslands with borassus palms. Woodlands with forest patches are located south of the river. Tourists can spot four of the Big Five, as rhino is the only one absent. Buffalos and elephants can be seen on every corner, as well as dozens of lions. There are also several antelope species including Uganda kob, oribi, grey duiker, Jackson’s hartebeest, and bushbuck. Zebras are absent and hyenas can be spotted on rare occasions. Thanks to the Victoria Nile, you will be able to spot hippos and crocodiles. For chimpanzee tracking, go to the nearby Budongo Forest. The best time to watch wildlife in the Murchison Falls National is during the dry season that runs from December to February. The temperature tends to be really high in January and February. You can also spot a variety of wildlife during the wet season from June to November. December, January, and February: There is little rain and plenty of sunshine during these three months. The average temperature is 33°C/91°F at daytime, while nights are a bit cooler and the temperature drops to around 18°C/64°F. March, April, and May: The rain starts falling in March, but more rainfall is expected in April and May. Daytime average temperature is 31°C/88°F. At night, the temperature usually doesn’t go below 20°C/68°F. June and July: These two months bring a mixture of clear skies and rainy days. The average temperature during the day is around 30°C/86°F. August, September, October, and November: Expect to witness plenty of rainy days during these 4 months. Although it doesn’t rain every day, there are torrential storms at this time of year. By November, temperatures start to increase. 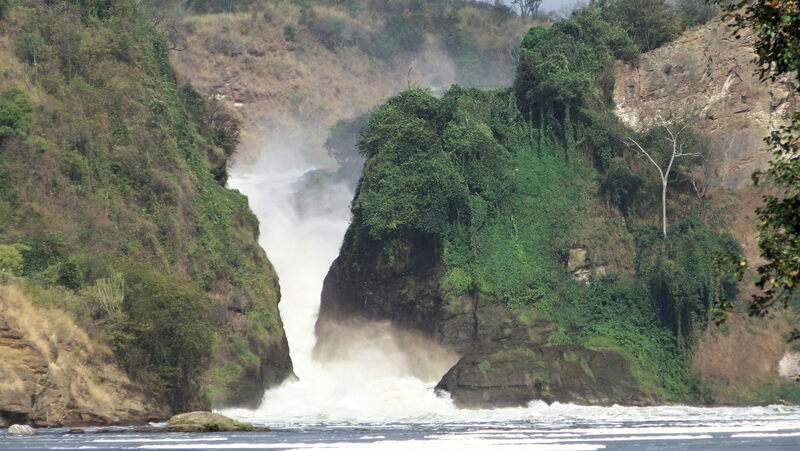 Murchison Falls is mostly visited as a part of the add-on safari package. Located 305km/190mi north of Kampala, Murchison Falls NP can be reached by vehicle in four hours. You can also fly to Bugundy, Pakuba, and Chobe Airfield by a scheduled or chartered aircraft service from two of the main airports, Entebbe International Airport (EBB) or Kajjansi Airfield near Kampala. If you are visiting from abroad, expect to arrive at the Entebbe International Airport (EBB). This airport is located 46km/29mi from Kampala. The local tour operator usually arrangers pick-ups from the airport and is in charge of the further transportation as part of the safari package in Uganda. A UNESCO world heritage site, Bwindi Impenetrable National Park is the best destination in the country for tracking mountain gorillas. The part itself is home to several habituated groups and protects half the world’s population of mountain gorillas. Visitors will also find around 350 species of birds including dozens of Albertine Rift endemics in the forest. Located right on the edge of the Albertine Rift Valley, Bwindi is a pristine rainforest with a terrain that consists of valleys and a string of ridges. It is home to one of the most diverse species of East Africa and has 10 tree species which can’t be found anywhere else in the country. Mountain gorillas are definitely the main attraction in Bwindi. There are approximately 400 individuals, of which more than a hundred are habituated. Bwindi also houses more than 120 mammal species and the Queen Elizabeth NP has more species than them. Most of the species in the forest are small with the exception of the elephants, but they are rarely to be seen. There is more chance that you will spot some of the six antelope species including a couple of types of duiker and bushbuck. 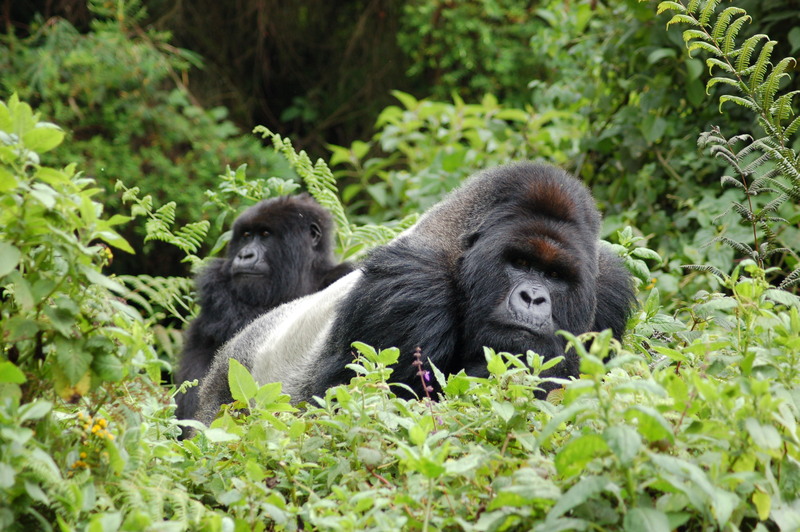 One of the main factors that need to be considered when choosing the right time to go gorilla tracking is the rainfall. If there is heavy rain, expect to find very challenging and slippery hiking trails. There is less chance that you’ll see rain during the dry season that runs from June to August and December to January. All of the forest trails are less slippery at these times. Your chances of a gorilla viewing experience are higher during the dry season and it’s definitely a better time for taking photographs. Bwindi Impenetrable National Park is open throughout the year. June, July, and August: June and July are considered being the driest months in Uganda, but there is still a chance of rain. In August, the chances of rain increases. As for the average temperature, it ranges from 23°C/73°F in the afternoon to 11°C/52°F in the morning. It can get colder at higher altitudes. December, January, and February: Although this falls under the dry seasons, there are still chances of rain during these three months. Expect less rain in December and more rainy days in February. The average temperature during the day is around 24°C/75°F, while morning temperature is usually close to 11°C/64°F. March, April, and May: Expect a lot of rain in April. Driving to Bwindi may become difficult during the wet seasons, due to poor roads. The forest trails are known to be difficult for hiking and slippery. The average daytime temperature is around 23°C/73°F and the morning temperature rarely goes above 12°C/54°F. September, October, and November: October and November are months when you should expect a lot of rainy days. It is not uncommon that the rain continuously falls for several days. The average daytime temperature in September, October, and November is around 23°C/73°F. In case you are visiting the country as a part of the Ugandan tour, it will take you two to three hours to reach Queen Elizabeth NP from Bwindi. The trip from Lake Mburo NP to Bwindi lasts approximately from 4 to 6 hours. People who are coming from Kampala and Entebbe will need 6 to 8 hours to reach Bwindi. Traveling in a 4WD is a must during the wet season. Scheduled and charter flights also transfer passengers to Bwindi. Entebbe International Airport (EBB) is the main airport and this is where most of the visitors enter Uganda. It is conveniently located just 46 km from Kampala, the capital of Uganda. You can also take a domestic flight from Entebbe or Kampala (Kajjansi Airfield) to Kihihi or Kisoro near Bwindi. Bwindi can also be reached via chartered flights.